... to the creative world of Anne Daniel - weaver and fibre artist - who lives near Hokitika on the beautiful and rugged West Coast of Aotearoa/New Zealand's South Island. 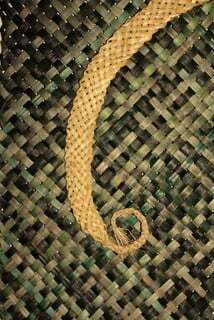 I put an entry “Helical” into Hokitika Junk2Funk this year. The theme was “SprinG”. Entries need to be made from at least 75% recycled materials. A friend, who delivers The Press newspaper, gave me a large rubbish bag of plastic strapping tape that comes around the bundles of newspapers. There were three different widths, black and two whites. Now what? I began with the concept of a coiled or helical spring. I tried various ideas for using the tape as it is before deciding to weave the black tape it into a long rounded four-strand plaits – one of these being over 50 long – and coil them to create coiled springs or helices. In total there was over 70 metres of plaiting. There was a lot of problem solving involved; how to join the strips and on how to hold the coil together. I tried joining the strips with a hot glue gun. This seemed successful until I began plaiting and found the joins did not hold, so I ended up overlapping the strips as I went. I certainly got better the more I plaited! I tried various ways of holding the coils together; thread, wire and then came the break through – used nylon fishing line with purchased 4mm clear plastic tube for spacers. After sorting out the technical problems, the biggest concern was would there be enough tape to complete the design. Fortunately there was – just. The finished “garment” consists of a main helical spring over the torso, with six smaller ones for a collar, headgear, bracelets and anklets. I wanted any undergarments to be flesh coloured so as not to distract from “Helical”. Going naked wasn’t an option – apart from anything else, the plastic would have been uncomfortable. I found a blue cotton and elastane long-sleeved top at an op shop that was body fitting and long, so an ideal size. I got out my blue, red and yellow cotton dyes. My first dyeing attempt was very patchy and nowhere near the right colour. After a 24 hour soak in bleach, I did three more dyeing sessions before I got a colour I was happy with. My husband had agreed (happily?) to model the entry but on completion I found it fitted on me and I could get it on and off on my own (with a little effort) so in the end I modelled it. Rob was relieved! “Helical” was worn over the dyed top, flesh coloured pantyhose on my legs and over my hair – an almost naked look which was just as I had planned. I hadn’t realised quite how realistic it was until I saw the photos as I had only seen my top half close up until then. Then the many comments on how brave I was made more sense. I have had a bit of fun making this record of “Helical”, my entry in Hokitika Junk2Funk 2018. Enjoy! 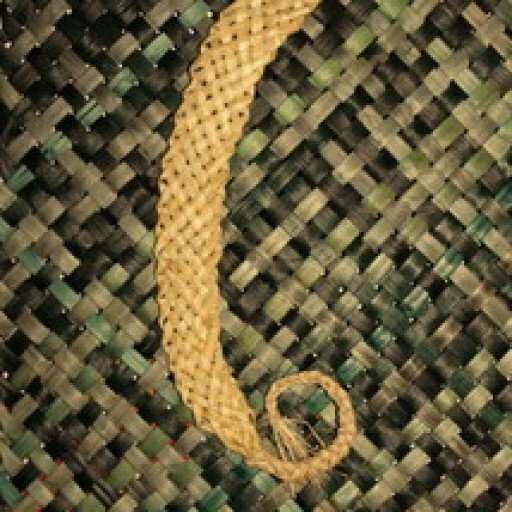 A weaver/ fibre artist creating unique, quality, hand-woven wall art, kete and three-dimensional pieces, out of harakeke (NZ flax) and other plant and animal fibres. Copyright © 2017 Anne Daniel All Rights Reserved.